A replacement #34 arctic white medium furnace access door for some Atwood furnaces. Atwood Mobile Products, LLC has been a world leader in designing, engineering and manufacturing appliances and hardware for the RV industry for over 30 years. Whether it's our constant drive for innovation and improvement or our unwavering commitment to our customers it's no coincidence that Atwood Mobile Products, LLC has found itself an integral part of the RV industry for now and many years to come. 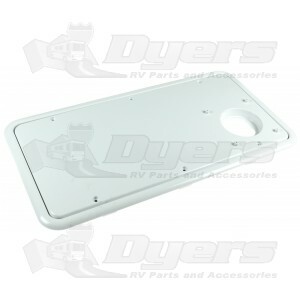 Overall: 19-3/4" x 10-1/4" x 1-1/2"
Door Only: 18-1/4" x 8-1/4" x 1-1/4"